Its genome is 1.259 million base pairs long, which is 6.5 percent longer than the previous record holder among giant viruses. In that abundance of DNA are 1120 genes. That’s hundreds more genes than found in a lot of bacteria. -- Carl Zimmer on a the world's most ginormous virus. Some have even argued that they represent a new domain of life, although others aren’t so sure, Zimmer notes. 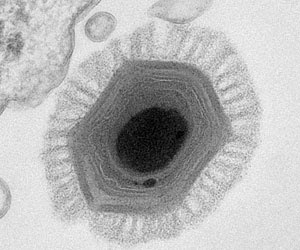 Jean-Michel Claverie, who discovered it, says the fact that it shares cell-like genes with the mimivirus is 'definitive proof' of a cellular ancestor.